ANGEL NAVARRETE - Jacinto Garcia buys baked goods with Turutas, the social currency used in the Catalonian fishing town of Vilanova i la Geltru, Spain. “Instead of just being a desperate way for people to survive a horrible economic crisis, this is part of the cooperatives, credit unions, community banks, organic farms and recovering factories — the alternate economy — that the Occupy movement is groping towards,” North said. In Vilanova i la Geltru’s central square, a growing number of stores — including a Catalonian bread shop, a deli and an electronics vendor — now post blue “Turutas aqui si” (Turutas accepted here) signs in their windows, along with the ones that let people know that MasterCard and Visa are welcome. Started as a way of breaking with the global financial system, the alternative currency — named after a traditional wind instrument — has been embraced by only about 190 of the town’s 67,000 residents. But organizers say more are signing up as the crisis deepens. Ton Dalmau, 57, one of the founders of the initiative, said the goal is to keep the money in circulation so the bank where people keep their Turutas does not offer any interest. “We are returning money to its origins and making it purely a system of exchange,” he said. 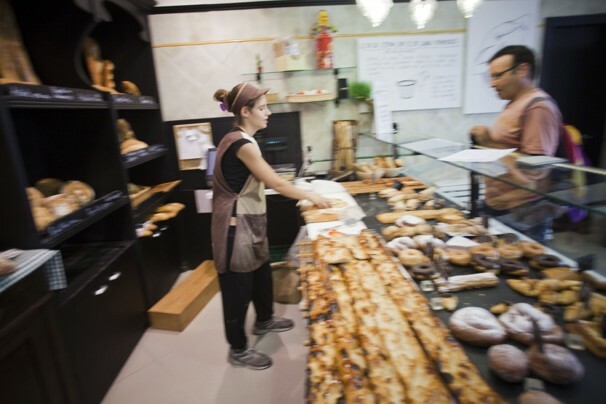 Jordi Morera, 25, whose family owns the bread shop, said that accepting Turturas hurts his bottom line because his raw materials can be paid for only in euros. But he said the sacrifice is worth it because he believes in the goals of the initiative. “Money limits our lives more than we realize,” Morera said. In Malaga, David Chapman, 65, said social money encourages innovation because you have to start thinking about different services or products you can offer to be able to participate in the market. Chapman, a carpenter originally from Britain who has made Spain his home for 25 years, said he recently sold six sun ovens he had made, for a total of 300 comuns, the community’s virtual currency. He was planning on cashing some of them in to pay someone to paint his house. Launched three years ago by Chapman and some friends, the project has seen dramatic growth. From March to August, the number of people using the virtual currency has jumped from about 250 to 470, with most of the newcomers in their 20s and 30s. The scale of the Barcelona projects is significantly larger, with more than 100 time banks that range in size from a few dozen members to 3,000. Sergi Alonso, a 30-year-old computer technician who has been unable to find a full-time job, said he has helped numerous neighbors develop Web pages and troubleshoot hardware problems through a time bank. In return, he was able to get private sewing instruction and piano lessons and learn about graphic design. Time banks help remind people that “regardless of your skills, you can always bring things to others,” Alonso said. Melissa Privitera, a 41-year-old restaurant owner, is working with other parents in her 4-year-old son’s school to set up their own time bank. As the crisis spreads, even those in her upper-middle-class neighborhood are losing jobs. People can no longer afford to send their children to camp or to extracurricular classes or pay for extra babysitting for those nights they want to go out. “Even here there is a lot of anguish,” Privitera said. The one thing that unifies many of the banks is their philosophy that everyone’s time is equal— even if you’re a doctor, like Corcoles. Corcoles is in private practice and has seen a decrease in her salary because fewer people can afford her services. She said she planned to use about 30 of the 50 hours she had accumulated to pay a woman who is unemployed to dog-sit while she is on vacation.